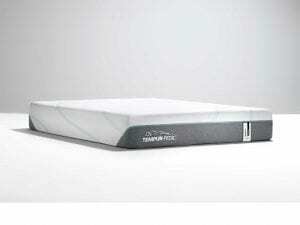 Are you looking for a comfortable mattress that won’t break the bank? Look no further than the 5 Star Woodscreek Firm, an incredibly popular innerspring mattress perfect for any room in your home. Here are just a few of the reasons you will love the 5 Star Woodscreek Firm. Firm mattresses give you the support your body needs, which is why back experts and sleep specialists alike tend to gravitate towards firm mattresses like the 5 Star Woodscreek Firm. 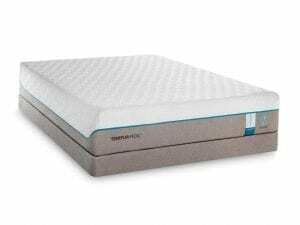 Supported by 391 PostureSmart® steel innerspring coils, this mattress offers an incredible stable and strong support system that will help you to get the rest you need. Nobody likes to feel like they are going to fall off of their bed, which is why the 5 Star Woodscreek Firm mattress is designed with a strong steel perimeter. This extra layer of support helps to prevent edge roll-off so that you can use more of your mattresses usable sleeping surface. To create jobs and help support the economy, all 5 Star Mattress sets in Las Vegas are designed and built in the United States. In addition to complying with US safety regulations, the “Made in America” seal also helps to lower emissions and pollution, since some countries do not have the stringent environmental controls the United States does. By building their mattresses in the USA, Five Star Mattress sets are also less expensive to ship—which means Best Mattress can pass that savings onto you. Everyone wants to fall asleep at night without wondering what they are breathing in, which is why Five Star Mattress sets are made with foams that are CertiPUR-US Certified. These special foams are made without dangerous chemicals such as formaldehyde, ozone depleters, TCEP flame retardants, phalates, and heavy metals, protecting your safety and preventing problems. 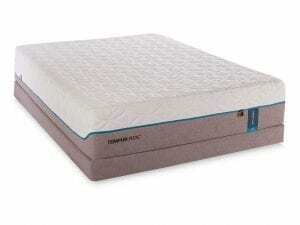 Foams that are CertiPUR-US Certified also emit fewer volatile organic compounds, protecting your air quality. Five Star Mattress offers a 1-Year limited warranty on all of their mattress sets, protecting customers from manufacturer’s defects and problems like sagging and body impressions. 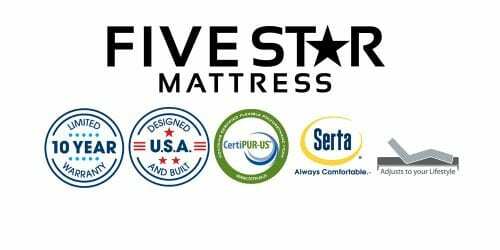 Best Mattress believes in partnering with top mattress manufacturers across the United States, which is why they are proud to be carrying Five Star Mattress products. Dedicated to delivering superior products for less, Five Star Mattress has a network of 23 factories across the nation, lowering production costs and shipping expenses. Because they market less than other manufacturers and buy top materials in bulk, they can offer brand name quality products for a lot less than some of their competitors. 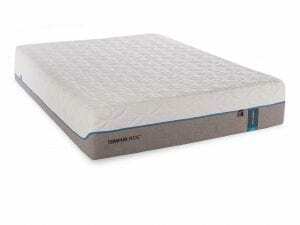 If you are on a budget but you need a comfortable mattress set, visit a Best Mattress location near you to explore the economical Five Star mattress series.